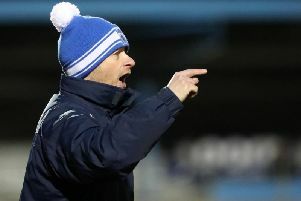 Glenavon assistant manager Paul Millar is calling on the Lurgan Blues to learn lessons from a frustrating run of results. Glenavon lost a 2-0 lead against nine-man Linfield, with the away side forced to field outfield player Mark Haughey between the posts for the majority of the match. The frustration at a failure to maximise the numerical advantage was increased by Linfield forcing a share of the spoils. On Tuesday, Glenavon battled from a 1-0 deficit against defending champions Crusaders to take a 3-1 lead. However, the final whistle confirmed a 3-3 draw following a Mourneview Park thriller. Millar feels there has been an on-going issue of game management. “We have dropped points too often this season, even if our records show the same return compared to last season,” said Millar. “There is no excuse for not getting a win from the position on Saturday. “But we must work on our game management and that ability to see it out. “We have plenty of experience in the squad and even the younger players have quite a bit of gametime clocked up. “We need to learn to kill a game off when in a winning position. “Small margins come into play and we must look back and count up quite a few dropped points.